Celery root mash is a different take on the standard holiday side dish. Every Thanksgiving I try to find new recipes to experiment with. I know that goes against tradition, but most years we celebrate the holiday as just our small foursome, and we’re still working on building up our traditions. So far all we seem to be able to agree on is a variety of side dishes so that everyone can have their favorite. I like stuffing, my husband likes mashed potatoes, my older son likes green beans, and my younger son is still testing out everything. You’d think that makes for plenty of side dishes (plus buttermilk herb rolls because carbs) but I often can’t help myself and end up making at least two more options. This year I’ve been seeing celery root (also known as celeriac) cropping up in more recipes, and I decided to go ahead and give it a try myself. It’s pretty weird looking, as roots and tubers tend to go, but like our other more commonly eaten roots and tubers, they’re delicious when roasted or mashed. Celery root is also low in carbohydrates and calories, though after we add our butter I’m not sure that matters. Still, it’s a good option to explore if you’re looking for something a little different. It can be a little tricky to prepare, if only because its knobby exterior makes a traditional peeler harder to use. I remove what skin I can with the vegetable peeler, and then carefully slice off the rest with a paring knife. You can also remove some of the more fibrous bits in the flesh, if you like. From there, simply dice and prepare just as you would mashed potatoes. This celery root mash is part of this month’s Progressive Eats, our virtual version of a Progressive Dinner Party. This month’s theme is all about A Vegetarian Thanksgiving and is hosted by Susan Pridmore who blogs at The Wimpy Vegetarian. This may be heresy to many who yearn for the traditional dinner, but this menu will either motivate you to nix the turkey this year, or at least provide inspiration for a new fabulous appetizer and side dishes. And we didn’t forget dessert for some sweet (gorgeous) endings to your meal. Peel celery root using a vegetable peeler or knife (or both). Cut into 1-inch chunks and place into a large pot. Cover with water and heat to boiling. Once boiling, reduce heat and simmer for about 45 minutes, until tender. Stir in parsley, salt, thyme, and black pepper. Taste and adjust seasoning. Serve with additional butter, if you like. I don’t think I could ever give up my beloved mashed potatoes, but I bet I could make them a little less bad for me by using part celery root. I do love the flavor! I hope you and your family have a great Thanksgiving, Megan! I think there’s room on my table for BOTH mashed potatoes and mashed celery root. I love the subtle celery flavor—your bowl is tempting me! Hope you have a terrific holiday! This is one dish that I haven’t tried to make yet and now I definitely must give it a go! I love that it has lower calories and higher nutritional value. I’m not sure this Irish gal could ever give up her potatoes, but like Liz, I’m sure I could make room on my table for both dishes! Have a wonderful Thanksgiving Megan! Celery root has been on my to do list for a long time! I was a little intimidated. But I really can’t wait to try this! It looks delicious! OK, real truth? I’ve never had celery root but your photos make me want to change that; it’ looks fantastic! Celery root is such an underappreciated veg. 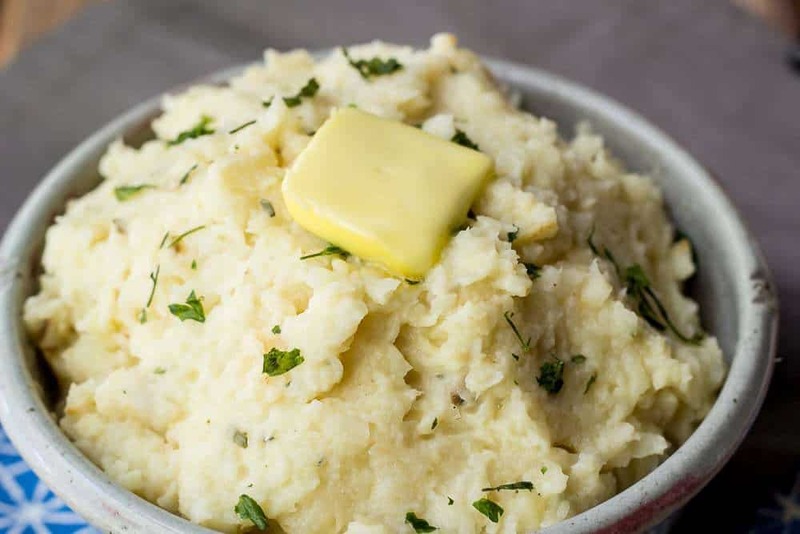 I just love its fresh clean flavor, and in a mash is one of my all-time favorite ways to eat it. Pretty sure I could eat that whole bowl full!